Practicing putting may seem boring for many golfers, who prefer using practice time to work on hitting longer tee shots or straighter irons. But because the number of putts you take is such a large part of your total score, practicing your putting stroke is a must. Use drills and activities to make putting practice more fun. Go out to the practice green with a playing partner and create an 18-hole competition. Keep score just like you would on the course. Select "holes" of various lengths with a variety of slopes. As you line up the putt to win the hole, imagine that you are on the actual course and the stakes are high -- the club championship perhaps or at least bragging rights at the office. You'll be training your mind and nervous system to deal with pressure putting. On long putts, golfers often struggle with either leaving the ball too short or hitting it well past the hole -- with a three-putt the frequent result. To get a better feel for distance, take a large piece of cardboard and cut out a circle three feet in diameter. Choose a color that contrasts with the green. Place that on the green and stand 20 feet or farther away. Try to get your putts within the circle. When you get to the course, you will have more confidence that you can place your first putt in a spot that will make for an easier second putt. A player may be so anxious to see where the ball ends up that he lifts his head too soon. Keeping your head steady isn't just advisable for shots with woods and irons. The tendency to peek at putts can lead to not completing a smooth stroke, causing the ball to deviate from the intended track to the hole. 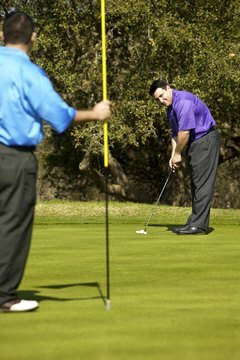 A good practice drill is to hit a series of five-foot putts and concentrate on not looking at the hole at all. Stroke the putt and listen for the ball to fall into the cup. Curtis Strange, who won two U.S. Opens partially because of stellar putting, uses a simple drill to keep the putter blade going straight back and straight through after the putt is struck. He places a series of golf balls in parallel lines that is just slightly wider than the length of the blade on his putter. He places another ball between the lines and strikes a practice putt. If he bumps any of the other balls with his putter on the way back or through the stroke, he knows he is not swinging the putter on the straight path he wants, which can cause putts to slide offline, either left or right. One way to build putting confidence is to practice short putts until you can routinely sink them, and then move on to putts from a longer distance. Put two balls down two feet from the hole. When you sink both, move out an additional foot and try to sink two from there. Keep going further away from the holes until you sink two consecutive putts from 25 feet. How Do I Break a Golf Score of 80?